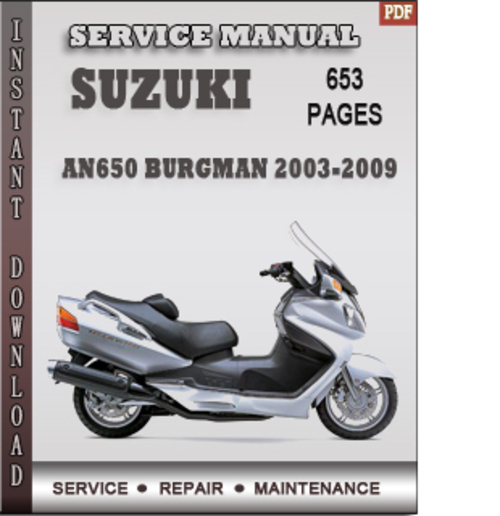 The Suzuki AN650 Burgman Factory Service Repair Manual covers 2003 2004 2005 2006 2007 2008 2009 year model. The Suzuki AN650 Burgman manual has detailed illustrations as well as step by step instructions, and contains everything you need to repair,rebuild,refurbish or restore your motorcycle. All diagnostic and repair procedures are covered. You will find maintenance schedule and maintenace procedures to avoid future damage to your Suzuki AN650 Burgman. This repair manual contains 653 high quality pages with all the details you need to get the job done in the fastest and cheapest way. *"the index"-here you can see a general view about what this service manual content. The pdf format is compatible with all Versions of Windows & Mac. Delivery: Instant Download!!! No shiping cost!!! No waiting for your product!!! Checkout(payment procedures)-click on the "download button" or on the image of service manual and use paypal our credit card to make the payment after that you will recive the download link instantly. If you have any problem with our product or if you need more information don't hasitate to contact us at the email bellow.